Militants in Nigeria's oil-producing region say they have blown up a major pipeline belonging to Italian energy firm Agip. Agip has not yet commented on the claims. A military spokesman denied that a pipeline had been hit but said there had been a "skirmish". He also denied the militants' claims to have disarmed seven soldiers. Violence in the Niger Delta region has severely cut production in Nigeria - one of the world's main oil exporters. 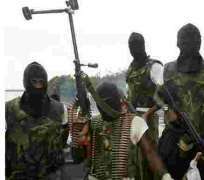 The Movement for the Emancipation of the Niger Delta (Mend) has rejected the government's offer of an amnesty, although another militant leader, Ateke Tom, has agreed to lay down his weapons. Mend has warned all foreign oil workers to leave the area. It says its latest attack took place in Nembe creek in Bayelsa State on a pipeline supplying crude oil to Agip's Brass exports terminal. "Our fighters encountered a military gunboat and all the soldiers numbering seven were dispossessed of their weapons. The gunboat was also stripped of its weapons before it was disabled by explosives," Mend said in an e-mail sent to news organisations. If confirmed, this would be the second attack in Bayelsa State this week, after a pipeline belonging to Shell was blown up on Wednesday. Correspondents say the militants seem to be expanding their field of operations, as most recent attacks have been in neighbouring Delta State. The military is currently pursuing a major offensive against the militants which has caused thousands to flee their homes. Mend say they are fighting for the rights of local people to benefit more from their region's oil wealth. But correspondents say many criminal gangs have taken advantage of the unrest to steal oil and extort money from oil companies.